The Lo Cósmico already exists over a quarter of a centruy, since 1976! 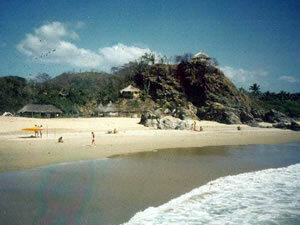 It was built, when Zipolite still was an untouched beach, without any water or electricity. The first kitchen was completely made out of wood, only enlightened by candles and flares. Even the crepes were made on the fire. Nevertheless this tiny restaurant grew to what would be the ultimate meeting point, often with people improvising music under the starry night, other nights with dances to music out of battery radios. The Lo Cósmico started to grew, we built more and more huts around the little hill, each one unique in its construction and interiors. All are made out of natural material like mud and palm leaves. 1997 a hurricane destroyed Zipolite and the Lo Cósmico. We had to rebuild huts and roofs, but today the Lo Cósmico is rebuilt and waits for your stay under the shady palm trees. Upper picture: Foto from 1984 (!) with the Lo Cósmico entrance from the beach.